When the witch appears with the poison apple, little birds emerge from a nearby tree to attack the old crone. Snow White innocently shoos them away. 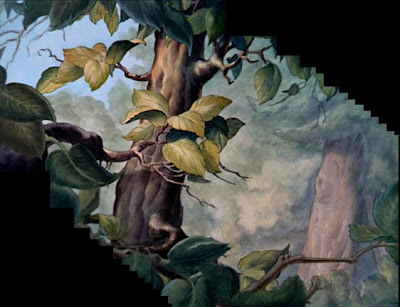 Here are two versions of the tree and leaves. The first digitally eliminates the birds, revealing a lovely palette of autumn colors.. The second, as we've never seen it, recreates a pan shot (background) as the birds fly back to the tree. 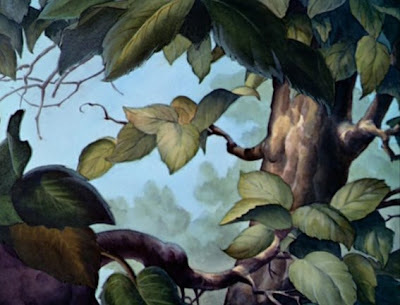 Truly lovely artwork, typical of the care and attention to detail that went into all aspects of SNOW WHITE.